The Aquarium of the Pacific is nationally recognized for its bold and innovative approach to ocean education. Pacific Visions will heighten our impact. The World Ocean is a majestic, largely unexplored, natural playground—where generations have built sandcastles, discovered new creatures, and enjoyed picnics under multi-colored sunsets. But our children stand to inherit a planet they need to know more about. Pacific Visions is using the best of informal education, building on elements and strategies from museums, science centers, and aquariums around the world, to ignite a passion for the environment in future generations. 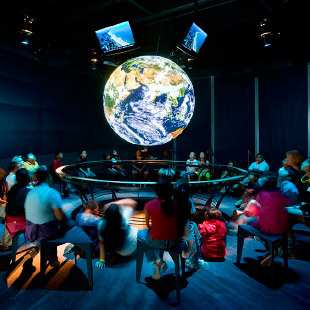 For visiting schoolchildren, the Pacific Visions experience promises to be one of the most memorable and inspiring learning opportunities of their student careers. Pacific Visions will be the only experience of its kind in an informal learning venue. It will model ways for communicating about ocean exploration, conveying critical environmental issues and sparking an interest in and a passion for scientific discovery for diverse audiences. Nearly 200,000 students and teachers participate in the Aquarium’s education programs for schools each year, and our programs are at maximum capacity during peak seasons. Pacific Visions will grow our capacity to serve 20 percent more schoolchildren and teachers every year. For local schoolchildren, the wonders of ocean exploration provide an inspiring way of learning about complex scientific concepts ranging from animal physiology, to the chemistry of the ocean and its influence on climate, to the high-tech equipment scientists use to discover new things about life on our planet. Just as scientists do, schoolchildren will ask questions about animals they have never seen before, they will use interactive technology and real-time data to formulate ideas about the effects of urbanization on our World Ocean, and they will engage in conversations about the future of our planet with their peers, teachers, and Aquarium educators. Using diverse learning modalities and technologies that younger generations embrace, Pacific Visions will celebrate and encourage ocean exploration and scientific pursuit. National and state standards for science learning are now employing the model of informal science education institutions like the Aquarium of the Pacific by exploring science as more than a body of knowledge—as a process. In Pacific Visions, students will use what they learn to ask relevant questions, define problems, investigate alternate plausible outcomes, and formulate ideas in an immersive, technologically dense environment that encourages conversations with peers and Aquarium educators. Complementary interpretive programming, new curriculum, and additional teacher resources will help educators relate their Aquarium experience directly to standards for science learning, including the national Next Generation Science Standards and the California State Common Core Standards. Pacific Visions will inspire students to pursue careers in STEM-related fields by giving them the opportunity to experience the thrill of scientific discovery in a powerful way, without fear of failure. The United States was once the envy of the world for the quality of our science, technology, engineering, and mathematics (STEM) education programs. We now rank near the bottom of all developed nations. 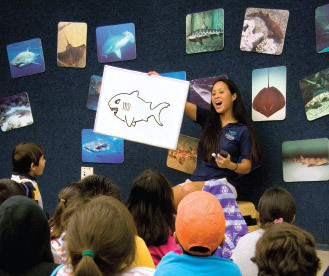 To recapture the imaginations of our youth and regain global competitiveness, formal K-12 institutions are partnering with informal science educators like the Aquarium of the Pacific, where students can explore and experience the thrill of discovery and the wonders of nature in safe, supportive environment. At the Aquarium, students can explore marvels of the natural world, investigate science, and meet Aquarium staff members and visiting scientists who have rewarding careers in STEM-related subjects. The immersive and dynamic platform of Pacific Visions will create myriad opportunities to showcase careers in STEM fields and demonstrate the importance of STEM subjects in creating a more sustainable future. 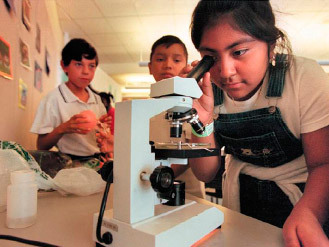 Students will learn that science is accessible and that scientific pursuit is a natural extension of an innate desire to explore the world we live in. Aquariums and museums provide an important service beyond the classroom by engaging the entire family in scientific discovery and by extending lifelong learning to visitors of all ages. Pacific Visions will give children, teachers, and multi-generational groups of family members and friends the opportunity to investigate science and the ocean in environments that combine breathtaking live animal exhibits, state-of-the-art technology, and imaginative storytelling. With the completion of Pacific Visions, the Aquarium will be able to serve 2 million visitors each year, increasing our capacity by 25 percent. We have the potential to reach a substantial number of people over time—and the responsibility to transform our community’s ideas about the changing relationship between people and the planet. 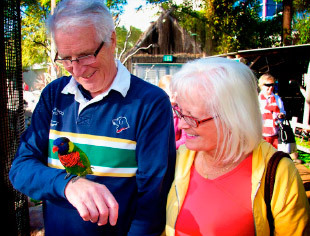 The unique composition of our visitors includes young families, seniors, couples, extended families, and various other multi-generational blends of families and friends. Pacific Visions will leverage these social relationships through exhibit design and story development to enhance the Aquarium’s ability to inspire, educate, and empower all students, including those from traditional classrooms, as well as the majority of guests—families and friends committed to learning together. Pacific Visions is designed to fuel an interest in science and learning while creating a sense of community to emphasize our collective role in creating a more sustainable future. Over the next ten years, as the consequences of global climate change increasingly affect our everyday experiences, the Aquarium of the Pacific will reach millions of children and teachers to make a powerful positive impact—on the future of our workforce, the fabric of our community, and the future of our ocean planet.